The January birthstone is Garnet in pretty much every tradition except for the mystical where it is Emerald (and the secondary birthstone for January is Rose Quartz). Garnet is also the anniversary gemstone for the second and sixth year of marriage, the zodiac birthstone for Capricorn and Aquarius, and the planetary stone for Pluto. I love the brilliant sparkle of garnets (it also happens to be my birthstone! ), and I’m not the only one. They have been popular for thousands of years (even though many of the varieties we talk about here have been found in the past century), both as adornment and as protective talismans. Legend has it that Noah put a garnet in a lantern to light his way in the night, and the ancient Egyptians, Greeks and Romans all used them in jewelry. As usual, if you want to skip the text and go straight to the featured charms and pendants, just scroll down to the end of the post. 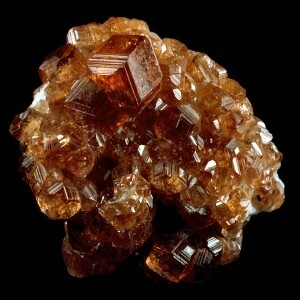 In crystal healing, garnets in general are connected to the sacral chakra and are believed to help with the reproductive system and PMS, boost passion for life, charisma, creativity and libido, stabilize emotions, combat negativity and feelings of inferiority, inspire love, bring luck, success and protection. 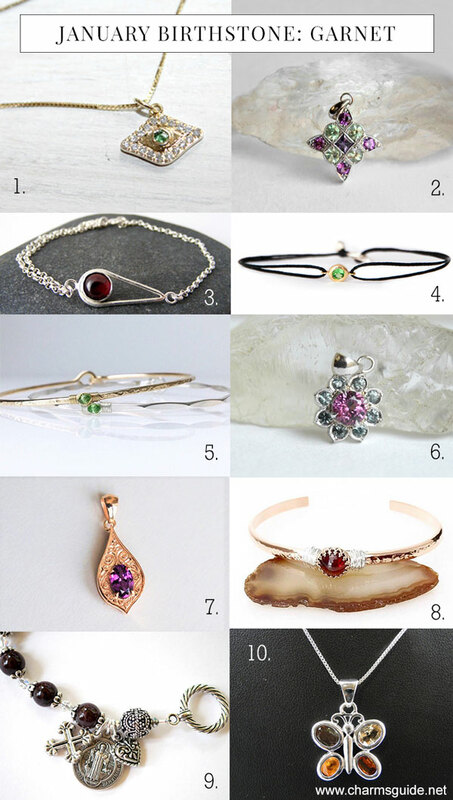 There is more on the specific properties for each type of garnet in the descriptions below. Garnet is most often thought of as a red gemstone (indeed the word “garnet” is often used to describe deep red items), but the fact is that garnets come in many different colors, each with its own name and properties. Garnets are a family of silicates with basically the same crystal structure, and the variations in color are due to different chemical compositions. There is a lot of overlapping between the different types, and trade names abound. Even the experts sometimes disagree on what’s what, but everyone agrees that there are two main groups – Ugrandite and Pyralspite – which each include three “main species”. Rhodolite Garnets, a blend of Almandine and Pyrope. The name comes from the Greek and means “rose stone”, and these very pretty pink garnets come in many shades from light pink to purple. They were first discovered in North Carolina in the late 1800s, but today they are mainly mined in India and Africa. It is a fairly abundant and affordable variety. The most sought after (and most expensive) color is Raspberry pink. Rhodolites are believed to help with frigidity, stabilize the metabolism, and enhance inspiration and intuition. Mozambique Garnets. Also a mix of Almandine and Pyrope, and very similar to Rhodolites, but a bit darker and more on the red side. Widely available and affordable. Umbalite Garnets are a blend of Almandine and Pyrope with a little bit of Spessartite mixed in, resulting in a purplish pink stone, ranging from light to dark fuchsia. It is really a variety of Rhodolite named for the location where it is mined (the Umba Valley of Tanzania). Pretty rare and sought after, they can be on the expensive side. 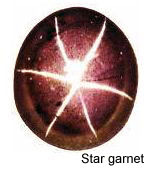 Star Garnets (also known as Asteriated Almandine) are such a dark red they almost look black. It is the state gemstone of Idaho (where, in addition to India, they are mined) and they get their name from rutile needles (mineral “straws” running through the stone), which create a star-like effect known as asterism. The most common is a four-ray pattern, but they are also found with six rays (supposedly in Idaho only). They are always cabochon cut, and fairly affordable. The Pyrope garnet family includes Rhodolite, Mozambique, Umbalite (all described above), and of course Pyrope. Pyropes, also known as Bohemian garnets, are those deep blood red stones that people usually think of when hearing the word garnet. They were extremely popular during the Victorian era and are often found in antique jewelry. Today however, they have faded from fame, and are consequently very affordable. This rarest and most expensive family of garnets include Demantoid, Mali, Melanite, Topazolite and Rainbow garnets. 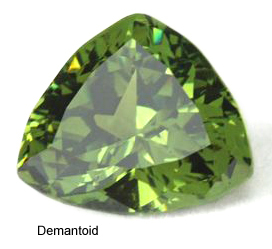 Demantoid Garnet is the star of the Andradite family and comes in a variety of green hues, from pale peridot-like yellow-green to intense, deep emerald-like hues. The stone, one of Karl Fabergé’s favorites, was first discovered in the mid 1800s and is the rarest, most brilliant, and most expensive of all the garnets. Generally, the darker the green and the clearer the stone, the more expensive it is. Demantoid garnets are believed to boost vitality and alleviate fear, insecurity and feelings of loneliness. Mali Garnet, sometimes called Grandite, is a mix of Andradite and Grossular garnet and was discovered in Mali in 1994. This beautiful brilliant yellow-green (and many shades thereof) stone is very rare and consequently expensive. The dramatic black opaque Melanite get its color from titanium. It is also sometimes referred to as Black Andradite Garnet or Titanian Andradite. It is common, very popular in jewelry, and inexpensive. Melanite is thought to remove energy blockages, enhance relationships and remove anger, distrust, envy and jealousy. The yellow Topazolite is named for its similarity in color to topaz, and comes in hues ranging from yellow-green to darker brownish amber yellow. It is rarely found in pieces large enough to use in jewelry. It is believed to help stabilize spiritual and emotional turbulence and protect frail people and young children. 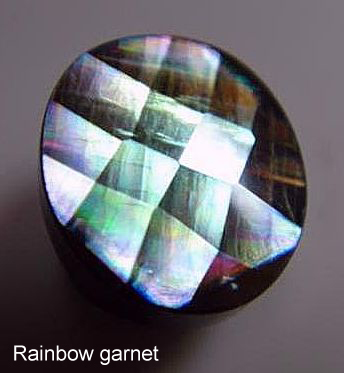 Rainbow garnet is an orange tinted dark brown iridescent Andradite first discovered in Japan in 2004, now also mined in Mexico and New Mexico. It is among the most rare of all the garnets and you don’t see it a whole lot in jewelry. 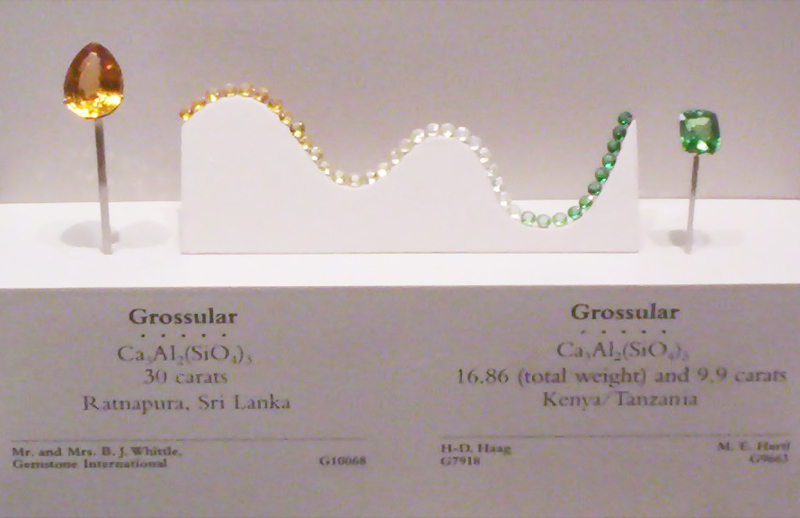 The Grossular Garnet family has quite a wide color range and includes Tsavorite, Hessonite, Merelani Mint, Rosolite, Leuco and Hydrogrossular garnets. In crystal healing, Grossular garnets are thought to help with emotional trauma and promote peace and tranquility, both externally and internally. The intensely green Tsavorite Garnet, ranging in hues from bright yellow green to deep, almost bluish green, was first discovered by Scottish geologist Campbell Bridges in Tanzania in 1967. Tsavorite was eventually brought to the US where Tiffany & Co’s Henry Platt gave it its name and started promoting it. 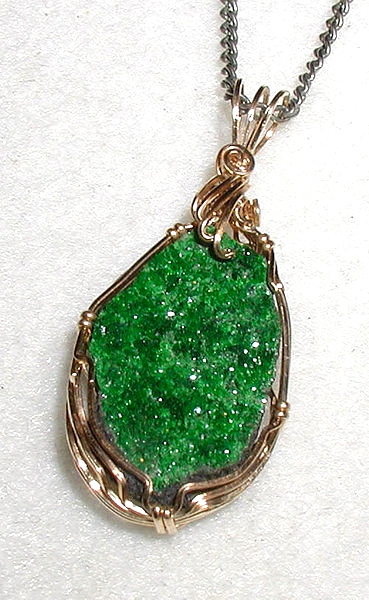 It is a rare and difficult stone to mine, but in spite of that, less expensive than emeralds. It is, however, the second most expensive of the garnets, and prices for “perfect” stones equal those of Demantoid. Tsavorite is connected to the heart chakra and is thought to help with inflammatory diseases like rheumatism and arthritis, kidney function and boost the immune system. Merelani Mint Garnets are “cousins” of Tsavorites and get their name (Merelani) from the area in Tanzania where they were first discovered. Also a brilliant, sparkling green, but lighter in hue, these garnets are rare and expensive. 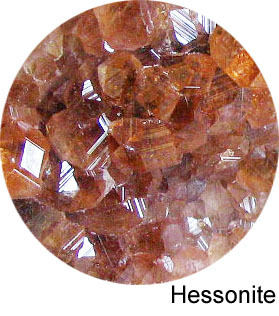 Hessonite Garnet ranges in color from almost clear to warm golden yellow, orange and brownish orange red and is also known as the Cinnamon Stone. It has been used in jewelry for thousands of years, particularly in carved pieces like intaglios and cameos. It is a fairly affordable stone thought to have many healing properties. It is an important stone in Ayurveda, where it is known as Gomed, and is associated with the planet Rahu. In short, it is believed that wearing a good-sized hessonite garnet can counter the ill effects that Rahu can cause, and it also brings luck, wealth, good health, success and longevity. In western crystal healing, it is believed to promote self respect, regulate hormones, and help us move forward in life and take on new challenges. Rosolite is a bright pink Grossular garnet that ranges from transparent to opaque. They are mostly mined in Mexico, very rare, and usually too small to be cut to gemstones. Leuco (from the Greek leukos, meaning “white”) garnets are fairly rare, transparent, colorless Grossular garnets, hardly ever seen in jewelry. Hydrogrossular garnets, also called Transvaal Jade, are inexpensive, opaque Grossular garnets from the Transvaal region of Africa. Spessartite (or Spessartine). First discovered in the mid-1800s in Spessart, Germany, the bright orange Spessartite was for some reason not particularly popular, except for among gemstone connoisseurs and collectors. These days, they are very popular, but in spite of that, fairly affordable, thanks to their relative abundance. Mandarin Garnets, also known as Tangerine, are highly sought after Spessartites from Namibia or Tanzania. They were first discovered in 1991, and the find helped propel Spessartite garnets into the spotlight. They are darker in color and much more expensive than “regular” Spessartites. Malaia (or Malaya) Garnets, a mix of Spessartite, Almandine and Pyrope, were first discovered in Tanzania in the 1960s. Colors range from pinkish orange to orange/brown/pink with a touch of yellow (stunning!) to rich honey hues to deep red orange, and the most priced are those described as peach colored. They are very rare, only found in the Umba Valley of East Africa, and prices range from fairly to very expensive. There is also a variety called Imperial garnet, which is very similar to the Malaia; the difference is that the Imperial garnets come from Madagascar or the Linde province of Tanzania. They are a mix of Spessartite and Pyrope and come in colors from very pale peach to red pink, often with rutile inclusions. Color Change garnets are amazing! A mix of Spessartite and Pyrope, they appear to change color depending on the lighting situation. Some are dramatically different, shifting from grayish green when viewed in daylight to deep red in incandescent light; some go from pale yellow in daylight to bright orange in incandescent; while others display only slight shifts in hue. It has always been said that garnets come in every color except blue, but the discovery of certain color change garnets changed that: there are some that look blue in artificial light, and purplish pink in daylight. Color change garnets are rare, popular, and expensive. The dark green Uvarovite garnets were first discovered in Russia in the 1830s and are rarely found in clear gemstone quality. More common is Uvarovite drusy. Drusy is a term for a coating of crystals that have formed on the surface of a rock, giving it a sparkly, sugar-like appearance, and as drusy has become popular in the jewelry world, you can find quite a bit of it. It is fairly inexpensive. These are not other varieties of garnets, they are names given to the stones above by traders, sellers, etc. for various reasons. – Gooseberry is another name for Grossular garnets. The word Grossular comes from the Latin grossularia, which means “gooseberry”. 1.18k gold chain with a tiny 14k gold evil eye charm pendant set with natural diamonds and a Tsavorite garnet. Tsavorite evil eye necklace by Danelian Jewelry. 2. Art deco style pendant set with Merelani mint garnets, Madagascar sapphire, and purple garnet from Mozambique. Handmade by Yvonne Raley of Cecile Raley Designs. 3. Sterling silver double chain bracelet with a teardrop centerpiece set with a red garnet. Garnet bracelet handmade by Tanya Garfield. 4. Waxed cord bracelet with a gold and Tsavorite garnet centerpiece by Vivien Frank Designs. 5. Delicate bangle bracelet in sterling silver, yellow or rose gold fill set with a micro-faceted Tsavorite garnet. Tsavorite bangle bracelet by Niccoletti. 6. 14kt white gold pendant with a Mahenge Malaya garnet and 8 grey-blue sapphires. Handmade by Yvonne Raley of Cecile Raley Designs. 7. Hand engraved 14kt rose gold pendant set with an untreated purple garnet from Mozambique. By Yvonne Raley of Cecile Raley Designs. 8. Cuff bracelet in sterling silver or yellow or rose gold fill set with a wire wrapped Mozambique garnet. Red garnet cuff bracelet by Niccoletti. 9. Silver and garnet Saint Benedict rosary charm bracelet by The Blessed Bead. 10. Sterling silver butterfly pendant set with Spessartite garnet, citrine and Andalusite. Butterfly pendant by Timeless Carats.